The Business Applications Research Center’s (BARC) The BI Survey is the globe’s largest annual worldwide, and vendor-independent, study of Business Intelligence (BI) software users. The BI Survey 12 is the 2012 edition, and eleventh iteration, of the study. 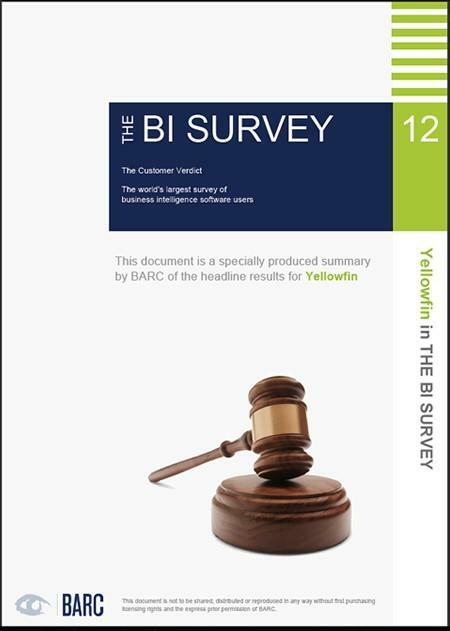 The BI Survey 12 was based on data derived from almost 3000 survey respondents. The survey offers insight into how and why organizations utilize BI technologies, and offers direct – apples-for-apples – comparisons between the BI market’s premier BI products across important functional, performance and support criteria. Yellowfin was identified as a standout performer in the study’s “Dashboard vendor” and “Small to Medium Projects vendor” Peer Groups across key product and customer satisfaction KPIs. The BI Survey 12 includes eleven aggregated KPIs, which can be absorbed at a glance. They are published in ‘The BI Survey Analyzer’. It also includes a set of 22 normalized KPIs, which are referred to as ‘root’ KPIs, for each of the 27 products. The ‘aggregated’ KPIs are aggregations of these root KPIs. This year, sets of KPIs have been calculated for each of the eleven Peer Groups. The values are normalized on the Peer Groups. Peer Groups are used to ensure similar products are compared against each other both in fairness to the vendor and for the benefit of the customer. The groups are essential to allow fair and useful comparisons of products that are likely to compete. The goal of this document is to help the reader spot winners and losers in The BI Survey 12, using well-designed dashboards packed with concise information.